Both over its long history and today, Mercedes-Benz has been a company that continues to innovate and find new solutions for safely and stylishly transporting drivers and passengers. That means that they’ve been at the forefront of many different safety-related innovations, such as one of their most important patents: official patent number 854 157. This concept shook the entire car industry. At the time (in 1951), the car industry was not held to the same safety standards as it is today. Cars were made without imagining what would happen if they got in a crash. What was worse was that stiffer, firmer cars were considered to be logically safer. Later on, Volvo would give away their invention of a three-point seat belt to save lives. Mercedes-Benz, on the other hand, had their own invention: the crumple zone. Crumple zones are now a fairly well-known safety feature of most vehicles along with seat belts and air bags, but before the 1950s, cars were not built to be hit. They were also not often crash-tested. The invention of the crumple zone demanded that we hit the drawing board again to re-think and conceptualize what makes a car safe. The ingenious Austro-Hungarian inventor Béla Barényi, famous for holding almost 2,500 patents, was the mastermind behind the project. He envisioned a way to protect passengers and allow the car itself to absorb the shock of impact, rather than the bodies within. He arranged components of the car so that they would not impact the passenger cabin. The resulting models in 1959, the Mercedes-Benz 220, 220 S, and 220 SE models, all had this new, amazing feature. It’s basic Newtonian physics: An object in motion tends to stay in motion, while an object at rest tends to stay at rest. When a moving car hits an object (such as another car), the passengers will keep moving at the same speed. The cars that were common during the 1950s, which often had firm, stiff outer walls, didn’t have a way of slowing either the passenger or the impact down. 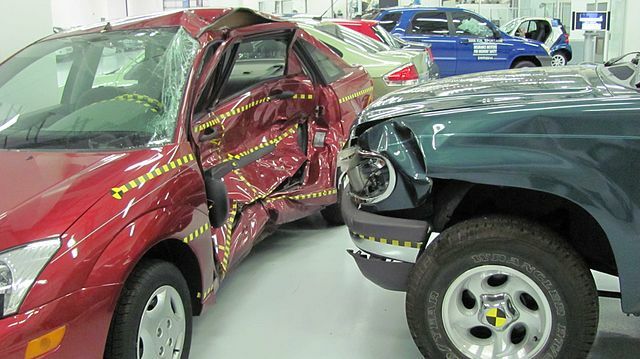 What the crumple zone does is increase the time in which decelerations are applied and effectively dissipate the energy of the collision away from the passengers. It creates an outer shell and a hard passenger shell, with defined deformation zones for when an impact does happen. Even thought it might sound odd, it’s very important and good to have a car that crumples versus one that doesn’t. It means that your car will take the brunt of the impact and dissipate as much force as possible before impacting you. It’s hard to say today how many lives the concept of crumpling has saved over the years, but it would likely be in the hundreds of thousands. Since the 1970s, many other car companies have adopted this concept, and now, it is considered to be an industry standard. ← What the Three-Point Star Emblem Really Represents: Is the Dream Possible?